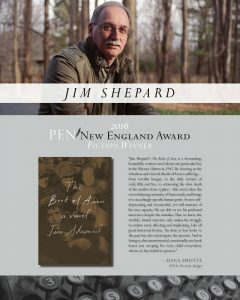 The PEN New England Awards are currently on hiatus. 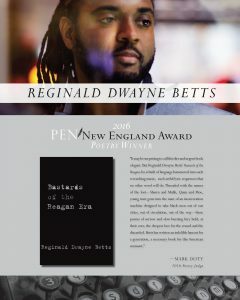 Celebrating New England’s long and illustrious literary tradition, the PEN/ New England Awards recognize outstanding fiction, poetry, and nonfiction by New England authors. Previous winners include E. B. White, Andre Dubus, Tracy Kidder, Mary Oliver, Susan Quinn, Anita Shreve, Swanee Hunt, Stanley Kunitz, Leo Damrosch, Louise Glück, Margot Livesey, Sebastian Junger, Jennifer Haigh, Reginald Dwayne Betts, Jim Shepard. Formerly called the PEN/Winship Awards, they were established by the Boston Globe in 1975 to honor long-time editor Laurence L. Winship. Jim Shepard is the author of six previous novels, including Project X, and four story collections, including You Think That’s Bad. His third collection, Like You’d Understand, Anyway, was a finalist for the National Book Award and won The Story Prize. Project X won the 2005 Library of Congress / Massachusetts Book Award for Fiction, as well as the ALEX Award from the American Library Association. His short fiction has appeared in Harper’s, The Paris Review, The Atlantic Monthly, The New Yorker, and elsewhere, and four of his stories have been chosen for the Best American Short Stories. He teaches at Williams College and in the Warren Wilson MFA program, and lives in Williamstown, Massachusetts. 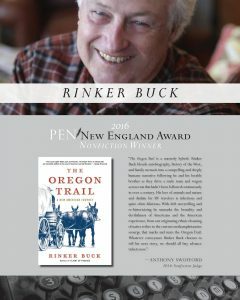 Rinker Buck began his career in journalism at the Berkshire Eagle and was a longtime staff writer for the Hartford Courant. He has written for Vanity Fair, New York, Life, and many other publications, and his stories have won the Eugene S. Pulliam National Journalism Writing Award and the Society of Professional Journalists Sigma Delta Chi Award. He is the author of the acclaimed memoirs Flight of Passage and First Job. He lives in northwest Connecticut. Reginald Dwayne Betts’s first poetry collection Shahid Reads His Own Palm won the Beatrice Hawley Award. His memoir, A Question of Freedom: A Memoir of Learning, Survival, and Coming of Age in Prison, received the 2010 NAACP Image Award for nonfiction. Betts was a 2010 Soros Justice Fellow, 2011 Radcliffe Fellow, and 2012 Ruth Lilly and Dorothy Sargent Rosenberg Poetry Fellow. He is currently a Yale Law student.